I just realized I never got around to sharing a card I had published in the March/April issue of Paper Crafts Magazine! I submitted this for article asking for country themed cards. 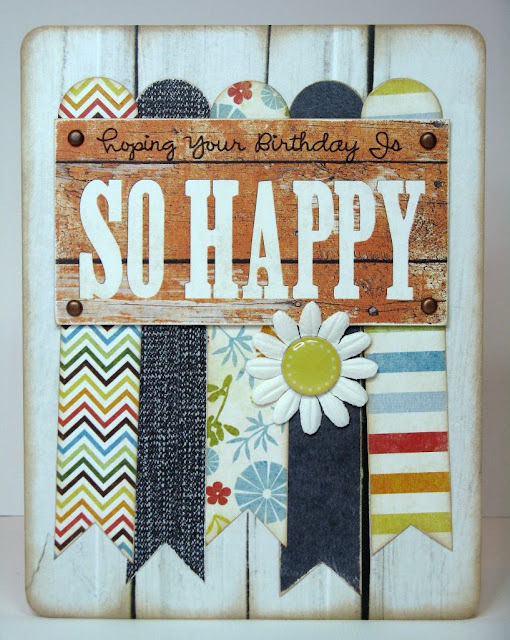 I ran one of the cardstock cutouts from the collection through my printer (attached to 8.5 x 11 sheet of paper) which allowed me to personalize the "So Happy" sentiment for any occasion. I then punched circles for scallop along top to look like they are part of the pennants hanging below. A little sanding & inking the edges completed my card giving it a worn country feel.